For just over sixty years, three companies, Milwaukee Iron Company, the North Chicago Rolling Mill, and the Illinois Steel Company operated successively at the same site in Bay View. Called colloquially the Bay View Rolling Mill, these companies produced iron and steel products for customers nationwide, played key roles in Milwaukee’s industrial growth, and employed thousands of skilled and unskilled workers, many of whom had emigrated from Great Britain and continental Europe. Eventually, Illinois Steel, the last of these three merged companies, became part of the massive amalgamation in steel and other industries that swept through America in the late nineteenth and early twentieth centuries. Many small manufacturers had sparked considerable industrial energy in Milwaukee by the end of the Civil War. But Eber Brock Ward, a wealthy Detroit industrialist and former Great Lakes shipping magnate, sparked new area growth when he opened the Milwaukee Iron Company in 1868 with 185 employees on twenty-seven acres in Bay View. Brock owned iron companies in Detroit and Chicago, was a pioneer manufacturer of steel rails, and was lured to Milwaukee by easy access to rich iron ore deposits in Michigan and nearby Iron Ridge in Dodge County. He built homes and boarding houses, donated lots for churches, and recruited skilled English puddlers and other artisans. The company produced re-rolled iron rails; metal bars called fish plates, which joined two rails together; merchant bar, which customers reshaped for other products; horse shoes; nails; and pig iron, a durable product made from smelting iron ore with coke and limestone in blast furnaces. By 1870, the company produced half of Wisconsin’s pig iron. 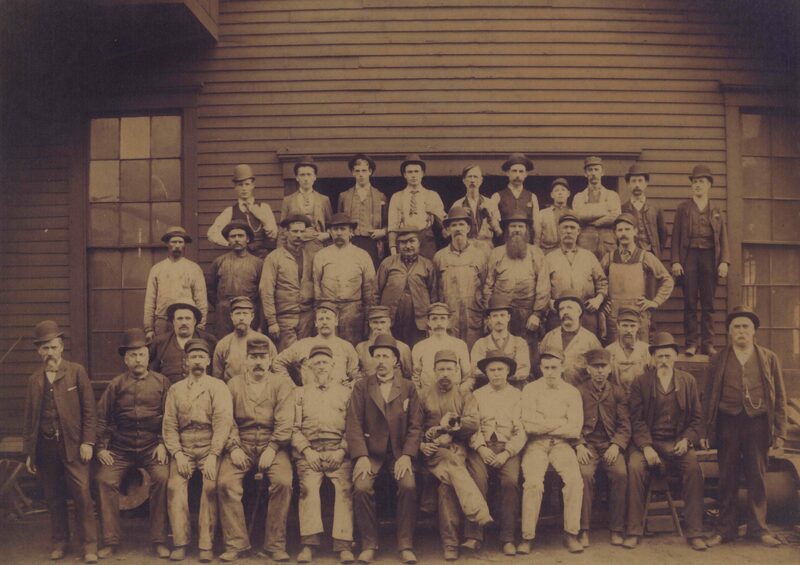 By the early 1870s, Milwaukee Iron employed one thousand workers and was a national leader in iron production. The depression of the 1870s, and Ward’s death in 1875, led the company into bankruptcy in 1876. In 1878, it was bought by the North Chicago Rolling Mill, which had its main plants in the Chicago area. Business improved, but in May 1886, many of the 1,500 mill hands, who worked twelve-hour shifts six days a week for low pay, joined thousands of other workers in the Milwaukee area and nationwide in strikes for an eight-hour day. 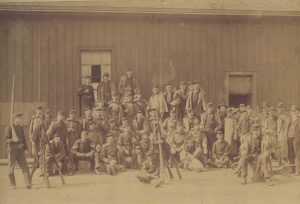 On May 5, state troops fired on a crowd of mostly Polish strikers as they approached the Bay View mill, killing seven and quashing the strike. Other mergers followed. In 1889, the Illinois Steel Company took over operations but struggled to stay afloat during the 1890s depression. By 1898, it found refuge in a new conglomerate called Federal Steel (Illinois Steel kept its name). The Milwaukee works expanded its product line, produced 397,000 tons of steel products, and accounted for $6 million of Milwaukee’s combined manufacturing output of $141 million. In 1901, when Illinois Steel became part of the United States Steel, the Milwaukee plant still employed some 1,600 men. Over the next two decades, Illinois Steel’s aging Bay View facilities were eclipsed by larger and more productive United States Steel plants. In 1929, Illinois Steel announced plans to increase production in the Chicago area. The Bay View works closed the same year. ^ Frank A. Flower, History of Milwaukee, Wisconsin (Chicago, IL: The Western Historical Co., 1881), 1283, 1285-1289, 1295-1301. ^ John Gurda, Bay View, Wis. (Milwaukee: Milwaukee Humanities Program, 1979), 12-13; Bernhard C. Korn, The Story of Bay View (Milwaukee: Milwaukee County Historical Society, 1980), 49-55; John Gurda, The Making of Milwaukee (Milwaukee: Milwaukee County Historical Society, 1999), 114; Bayrd Still, Milwaukee: The History of A City (Madison, WI: State Historical Society of Wisconsin,1948), 335-337; Milwaukee Iron Company, Manufacturers of Iron Rails, Fish Plates, Merchant Bar, Horse Shoes and Pig Iron, 42. ^ Milwaukee Iron Company, 42; Adolph Gerd Korman, “A Social History of Industrial Growth and Immigrants: A Study with Particular Reference to Milwaukee, 1890-1920” (Ph.D. diss., University of Wisconsin, 1960), 48; Second Biennial Report of the Bureau of Labor and Industrial Statistics, 1885-1886 (Madison, WI: Democrat Printing Company, 1886), 271. ^ Gurda, Bay View, Wis., 19; Korn, The Story of Bay View, 55-56; Gurda, The Making of Milwaukee, 116, 163. ^ Leon Fink, Workingman’s Democracy: The Knights of Labor and American Politics (Urbana, IL: University of Illinois Press, 1983), 188-194;Thomas W. Gavett, Development of the Labor Movement in Milwaukee (Madison, WI: University of Wisconsin Press, 1965), 58-64. ^ Abraham Berglund, The United States Steel Corporation: A Study of the Growth and Influence of Combination in the Iron and Steel Industry (New York, NY: AMS Press, 1968), 56; Peter Krass, Carnegie (New York, NY: John Wiley & Sons, Inc., 2002), 362-63, 365-67; David Nasaw, Andrew Carnegie (New York, NY: Penguin Press, 2006), 553, 554, 580; Jean Strouse, Morgan: American Financier (New York, NY: Random House, 1999), 397-400; Gurda, Bay View, Wis., 26. See also, Illinois Steel Company, U.S.A. Ships Its Goods to All Parts of the World (Chicago, IL: Illinois Steel Company, 1899), 5-13. ^ Kenneth Warren, Big Steel: The First Century of the United States Steel Corporation, 1901-2001 (Pittsburgh, PA: Pittsburgh University Press, 2001), chapter 1; Kraus, Carnegie, 410; Nasaw, Andrew Carnegie, 586-588; Gurda, Bay View, Wis., 26; Milwaukee and Its Commercial Industries. Descriptive of Its Productive and Manufacturing Enterprises, Financial and Trade Resources, Legal and Professional Interests (Milwaukee: Milwaukee Carnival Association,” 1899), 4-5. ^ “Illinois Steel Co. Will Expand Plants,” Pittsburgh Press, July 3, 1929, p. 9; Gurda, Bay View, Wis., 26. ^ Marker 275, Bay View’s Rolling Mill, Wisconsin Historical Markers website, last accessed August 15, 2017. Gurda, John. Bay View, Wis. Milwaukee: Milwaukee Humanities Program, 1979. Korn, Bernard C. The Story of Bay View. Milwaukee: Milwaukee County Historical Society, 1980. Still, Bayrd. Milwaukee: The History of a City. Madison, WI: State Historical Society of Wisconsin, 1948.